In a previous post, I wrote about Sauce Labs, and detailed how their Selenium-in-the-cloud service ("OnDemand") helped Web QA--particularly yours truly--quickly make sense out of a perceived performance regression, with really nice video support. It turns out that we keep having reasons to look to them for additional capacity and capabilities. And, thanks to a great working business relationship, they're helping us meet those needs. The problem: as stated in our Q2 goals, our team has to "Plan for and support a high-quality launch of http://persona.org". The goal goes on, stating that we'll support desktop on a variety of browsers, as well as mobile. The solution: It's often been said that companies should "focus on their core competencies" (I'll admit there are counter-points aplenty), and it's a view that I happen to subscribe to, especially given the demands on our team. To that end, instead of planning for, provisioning, and then maintaining the morass of browser environments on a plethora of operating systems, we increased our scope and frequency-of-use with Sauce Labs, covering what we reasonably could, in-house, at present, while immediately spinning up test coverage, and making our developers and supported Identity/Services QA team very, very happy. The here and now: as of this moment, we've been able to bring up 42 test jobs against myfavoritebeer.org (dev/beta) and 123done.org (dev/beta), covering the most-critical paths of login and logout; we're closing in on new-user registration and changing passwords, too. The future: as our testing needs increase, so, likely, will our usage of Sauce, and it'll be as easy as cloning a job in Jenkins and changing a single parameter, thanks to the built-in flexibility that Dave Hunt's pytest-mozwebqa plugin provides. So, thanks again, Sauce; just another example of helping the Selenium  and Open Source communities, and, in particular, Mozilla! 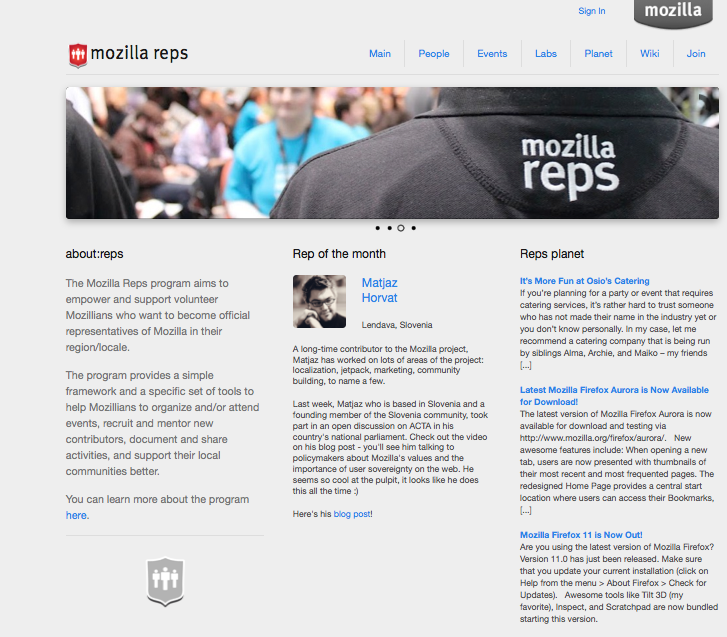 Testing help wanted on Mozilla Reps! While we support many Mozilla projects on the Web QA team, I'd like to highlight one that I've been working on for the last couple releases now: Mozilla Reps.
How can you help? Like all Mozilla projects, there's always a list of fixed bugs/features to verify, as well as a good amount of exploratory testing. For examples of the kinds of things we'd test for, check out a couple blog posts by yours truly: part 1, part 2. Your best steps to begin, are to visit the team in #remo-dev on irc.mozilla.org, and letting anyone in the channel know that you're interested in helping test! Eventually--I'm told--the plan is to incorporate elements (or the site wholesale) into Mozillians (https://wiki.mozilla.org/Mozillians), so look for that in the coming future! And, lastly, a link back to the Web QA homepage, in case you have any further questions, about this or any web-testing project(s) @ Mozilla! In addition to co-hosting/sponsoring many Selenium Meetups, we've been really grateful to have a generous and accomodating business relationship with Sauce Labs, which allows us to augment and complement our own custom-built Selenium Grid testing infrastructure with theirs. For our most recent Socorro release, I and the whole team (dev +QA) really came to appreciate one feature in particular: video, and for two reasons. To get you familiar with Mozilla's Selenium Grid setup, let me back up just a second; Dave Hunt has previously highlighted his pytest-mozwebqa plugin (still in beta) for our WebQA team, which--among all the many other awesome things it does--allows us to very easily use Sauce Labs' API to integrate with their OnDemand service. 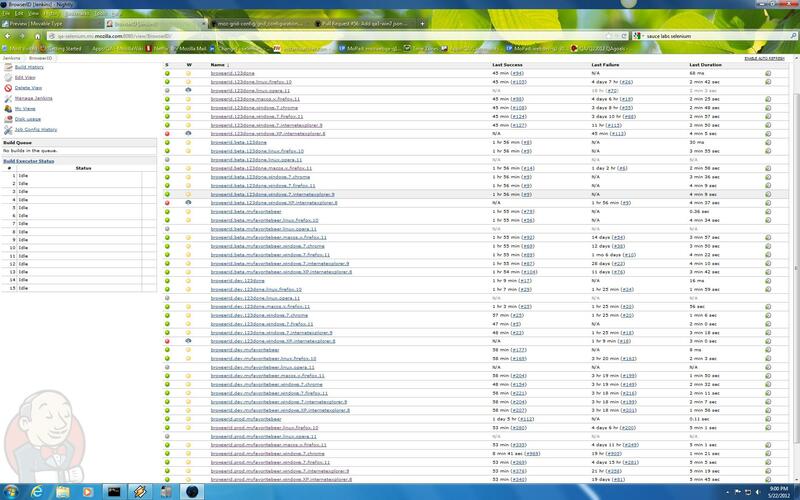 Inspired by the wealth of build-reporting information we get from Sauce, Dave set out some time ago to incorporate some of it--particularly capturing screenshots--as well as writing out HTML reports that link us to (if the job was Sauce-run) a Sauce Labs job #, complete with video for each tests. We looked at incorporating video a bit into our own infrastructure (as did David Burns in Lights! Camera! Action! Video Recording of Selenium), but soon realized that--given all the other challenges of shipping, on average, 7 websites per week, and dealing with our scale of 6 Mac Minis, archiving, disk space, etc.--it wasn't something we wanted to pursue, for now. For this particular Socorro release, we thought we had--immediately after we deployed--a huge performance regression. See bug 718218 for the gory details, and all the fun that ensued (over the weekend!). Typically, video is a "nice to have" feature, for us, as our team is quite familiar with debugging failing Selenium tests locally, and our HTML reports and screenshots go a long way, too; for this release, though, I was playing back-up for Matt Brandt, and, as the requisite pointy-hair, couldn't code or run a Selenium test to save my life (not quite true, but close!) When I began investigating why our Socorro test suite suddenly ran ~20 minutes longer than it ever conceivably should, I discovered it was in one of the search tests, test_that_filter_for_browser_results, which we later realized had an erroneous |while| clause that never eval'd to |true|. While I first looked on our own Grid instance, to try to watch (via VNC) our browsers running this particular test, Grid's distributed test-execution nature means that it never predictably ran on the same node each time. (In retrospect, I could've used pytest's keyword (-k) flag from a job in Jenkins to run the suspect test in isolation, but I digress.) I needed a way to quickly show our dev team the individual test, without having them or me set up a test environment, and firing off that test. Luckily, since Dave made the default for our Sauce Labs jobs public, all it took was a single run of the socorro.prod job via Sauce, find the individual test, and copy the link, which has nice annotated timestamps for each Selenium command, and quick paste in #breakpad. 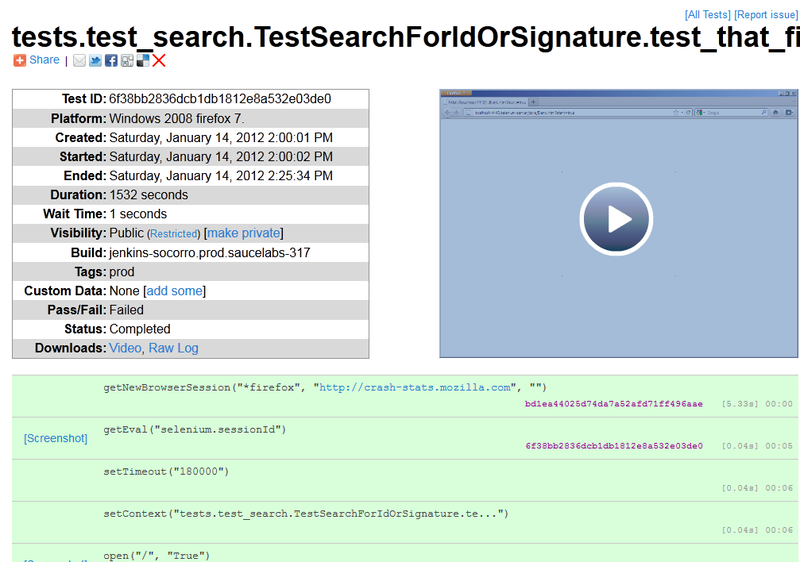 Earlier, I mentioned that their video support is great for two reasons: in addition to the above (the ability to view archived videos from past-run jobs), we also took advantage of the ability to watch the individual test--as it ran in real-time--and correlate the currently-issued Selenium command with the hold-up/"perf regression." We quickly isolated it to the aforementioned, bogus |while| loop, commented it and the accompanying assert out, and certified the release after more careful checking. Because it was the weekend, and folks were available at different times, once each member popped onto IRC, we simply showed them the "before and after" videos from Sauce Labs, and the team regained its confidence in the push. So, thanks, Sauce, for such a useful feature, even if it's (thankfully) not necessary most of the time! Mozilla, and WebQA in particular, looks forward to continuing to work with Sauce Labs and the Selenium project, in exploring ways in which we can work together to help further and bolster Selenium and Firefox compatibility. My awesome coworker Matt Brandt has highlighted the awesome work and contributions that Rajeev Bharshetty is doing for and with, Mozilla WebQA. I'd like to take this opportunity to call out another great contributor to (and with) WebQA: Sergey Tupchiy, who we nominated for Friend of the Tree (along with Rajeev) in this past Monday's meeting. Sergey has been instrumental: he helped us turn around a Q4 goal of having test templates custom-tailored for brand-new Engagement/Marketing websites (and which, quite frankly, has application and implications for our standard test templates, going forward. In 2012, and kicking it off this quarter, Mozilla WebQA (and the rest of Mozilla QA) will be taking a hard look at, and hopefully making many inroads into, a better community on-boarding story; we're blessed to have the great contributors we already do, but need to grow and scale to meet Mozilla's ever-increasing challenges. We're looking for contributors of all expertise areas, skill levels, and project interest; if interested, or just want to find out more information, please contact us via whichever below method best works for you, and we'll happily help you get started! 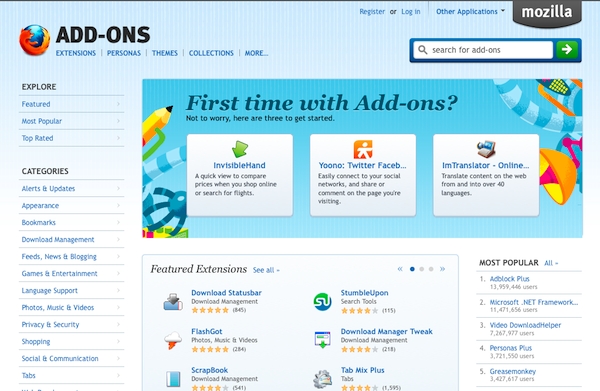 Today, our legacy (and pretty comprehensive) Selenium tests for the Mozilla Add-ons website (both written in Python), were forced into retirement; the reason? : our previously-blogged-about AMO redesign--code-named "Impala"--went live for the homepage and the add-on detail pages. community is the previous category. webqa is the next category.